Preaching is hard work. So is talking about preaching. Bryan Catherman of SaltyBeliever.com and I have just completed recording what I think is an exciting and informative podcast series for Salty Believer Unscripted on preaching and I want to share it with you. Over the last several weeks we have interviewed ten preachers of the Word. The preachers interviewed varied in experience level from having just preached their first sermon to having faithfully preached for over thirty-five years. We combined these interviews with some general discussion on who is called to preach and preaching in general spurred on by a little book called “Saving Eutychus” by Gary Millar and Phil Campbell. We asked each preacher, “What is your definition of preaching?” And what we found was a common thread of the proclamation and exposition of God’s Word, revealing Christ, with the goal of moving the listener to apply God’s Word to their heart and life. 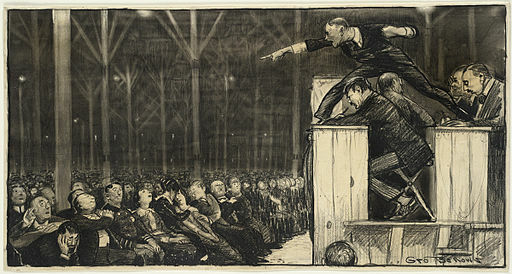 Each preacher’s definition was colored by their personality, just as God has gifted each of these preachers to preach in their specific context with their unique voice. We also asked these pastors to describe what it looks like for them to prepare a sermon, both in the physical act of studying, writing, delivering, and to explain the intertwined emotional roller-coaster of preaching. All our preachers varied in study prep methods and delivery styles; yet they all spent significant time ruminating on the Word of God, producing some sort of outline or manuscript, and adding rhetorical elements to their sermon with the goal of moving their listeners to surrender their lives to Christ’s Lordship. I learned a tremendous amount about preaching listening to the wisdom of these preachers and hope to incorporate a lot of their suggestions into my own preaching. I highly encourage you if you are looking to become a preacher of the Word to listen to the wisdom recorded here. Even if you are not a preacher, but regularly sit under the preaching of God’s Word, these interviews will give you a good insight into the life and heart of your pastor. Preaching is hard work. I want to extend a special thanks to all our guest preachers who contributed their time and energy to our podcast! Thank you: Andy Conroy, Kevin Lund, Robert Marshall, Dr. Travis Freeman, Trevin Wax, Kyle Costello, Rob Lee, Danny Braga, Douglas Wilson, Dr. Jim Hamiltion!